If you really want to impress everyone at your next Thanksgiving feast, plan to serve a fabulous cake along with your other desserts. Whether you're a novice, intermediate, or experienced cake decorator, there's a cake design that will match your skill level. If you're an experienced cake decorator, you can make a roast turkey cake that will amaze everyone who attends your holiday feast. Creating a cake like this requires some carving and modeling skills, and you can take creative license with the design in whatever way works for you. Prepare one cake mix, divide it between the two cake pans, and bake as directed on the package. When the layers are done, remove them from the oven and let cool for about 10 minutes before removing them from the pans to finish cooling on a baking rack. Clean the pans and repeat the process with the second cake mix. While the first batch of cake layers are baking, make a batch of buttercream frosting and then let it chill in the fridge for 45 minutes. When all four cake layers are completely cool, it's time to create the turkey's body. Lay one cake layer on the pastry board. Lay a tape measure horizontally across the middle of the cake, locate the 7 inch mark, and then make a vertical slice to remove that small section of the cake. Set it aside to snack on later and repeat the process with two more layers. This will give you three equal layers with one flat side that will be combined for the body. Slice just enough off the top of one layer to level it. This will be the middle layer of the body. To assemble all three layers, lay one layer top side down on the pastry board and frost the flat side with buttercream. Align the leveled layer on top of the first layer, and then carefully turn the two layers upright and transfer them to the cake board or platter, placing the cut flat sides on the bottom so the rounded sides face up. Frost the side of the middle layer and then press the flat side of the remaining layer against it. Using a knife, carve just a little cake off the edges of the outer layers to give the turkey a more rounded body. Push a kabob skewer horizontally through the middle of the body to give it a little extra stability and use kitchen shears to cut off any excess skewer that sticks out. Frost the entire three-layer body to crumb coat it and then put the cake in the refrigerator for about 20 minutes to let the buttercream firm up. While the cake body is in the fridge firming up, carve two equal-sized drumstick shapes from the remaining cake layer. This is most easily done by carving one drumstick with the bone end up on one side, and carving the other drumstick next to it with the bone facing down, sort of like a yin yang. Bring the cake body out of the refrigerator. Using buttercream, attach a drumstick to each side of the body, making sure the rounded side of each one faces outward and angling the feet slightly upward. Cut a kabob skewer in half and push one half horizontally through each drumstick and into the body to help hold everything in place. Carve a little off the outer edge of each drumstick to give it a more rounded, natural look. Crumb coat each drumstick with buttercream and return the cake to the refrigerator to continue firming for another 10 minutes. Use a little brown food coloring paste to tint about 3 cups of the buttercream the shade you want your turkey to be. Start with a small amount of coloring because you can always add a little more to achieve the shade you want. Bring the cake out of the fridge, and coat the entire cake with the brown-tinted buttercream, reserving about 1 cup of the buttercream to pipe the wings later. Frost the cake as smoothly as possible, but don't worry if it's not completely perfect. Add the cup of reserved brown buttercream to a piping bag fitted with a large open decorating tip and pipe a wing on each side of the body. You can create the look of a wing by piping the letter Z in reverse of the way you'd normally write it. Using the cake photo as a guide, pipe from right to left along the bottom of the body, coming up and piping back to the right, and then piping slightly up and to the left. Release the pressure on the bag when you're close to the end to create the wing tip. Pipe a wing on the other side to match the first wing. Return the cake to the refrigerator to firm up for at least another 20 minutes. Bring the cake out of the refrigerator. Lay a paper towel on top and lightly smooth your hands over the towel, taking extra care not to smash the wings. The dimpled texture of the towel will leave dimpled impressions on the frosting just like the dimples on skin of a real roast turkey. Continue moving the towel and smoothing it over the frosting until the entire turkey has texture. In a small bowl, combine a little brown food color paste with some water to create a darker brown wash, and paint it along the breast bone area, wings and drumsticks to create some shading. Use light strokes so you don't score the buttercream. Place the cake back in the refrigerator. Create the drumstick frills by cutting out two rectangles of parchment paper that are about 4 inches tall and wide enough to reach all the way around the end of each drumstick with a little space to spare. Fold each rectangle in half along the longest side and begin making 1-inch deep cuts at 1/8-inch intervals along the folded side to create the slits. Wrap a frill around one leg to make sure it fits, take it off and staple the ends together, and then slip it on the drumstick. Repeat the process for the other frill. Using the turkey cake photo as a guide, create whatever kind of trimmings you'd like to go around the edge of your cake platter. This can be done using fondant, or you can pipe the trimmings using more buttercream. Tint portions of your chosen icing to create vegetables, cranberries, mashed potatoes and gravy (made from caramel sauce), and any other food items that will hide the base of the cake and really finish the design nicely. Before Thanksgiving dinner, remove the cake from the refrigerator, arrange the fondant trimmings around it, and put the cake on display for everyone to admire until it's time for dessert. This cake looks like a pumpkin pie from the outside, and you can produce two "pies" from a single, two-layer cake mix. Creating this cake involves working with fondant and requires a small talent for working with dough to achieve the look you want. 1 cake mix in the flavor of your choice. Prepare the cake mix, divide it between the two pie pans, and bake it according to the package directions for two 9-inch rounds. When the cakes have cooled, leave them in the pans and frost the tops with a thin layer of vanilla buttercream frosting. Tint one package of the ready-made fondant orange and divide it in half. Wrap one half in plastic wrap to keep it moist until you're ready to use it. On a pastry board dusted with powdered sugar, roll out one half of the fondant into a circle that's big enough to cover the top of one cake with a little extra to spare. Carefully roll the fondant onto the rolling pin, transfer it to the cake, and lay it on top. Smooth the fondant over the cake from the center outward, carefully pressing it down around the edges. Using a small knife, cut away the excess fondant all the way around the inside rim of the pie pan. This creates the look of pumpkin pie filling. Using fondant from the second package, tint about a cup of fondant with 1 small drop of brown food coloring past, working it through until the fondant is a tannish crust color. Divide the fondant in half and wrap one half in plastic wrap for later use. Roll the remaining half of the crust fondant into a ball and then roll it into a long rope. Flatten the rope to create a thin ribbon that's about 1 inch wide. Carefully begin working the ribbon in all the way around the rim of the pie pan and cut off any excess when you reach where you began. You can use a small spatula to help push the crust down next to the edge of the filling fondant and then work your way around the rim of the pan again pinching the fondant as you go to give it that classic pie crust look. If you like, gather the leftover crust fondant you trimmed away, roll it into a ball, and then roll it out flat again. 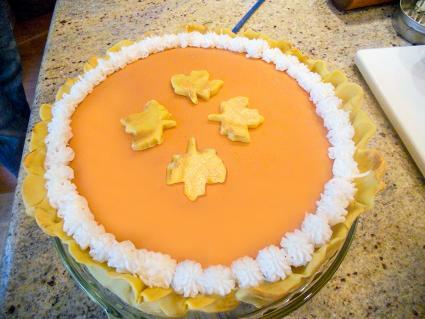 Use a small leaf-shaped cutter to cut leaves you can use to decorate the top of your pie (as pictured). Repeat the decorating process for the second pie/cake. Just before you're ready to serve your "pies," pipe whipped cream around the rims, concealing where the crust and filling fondants meet. 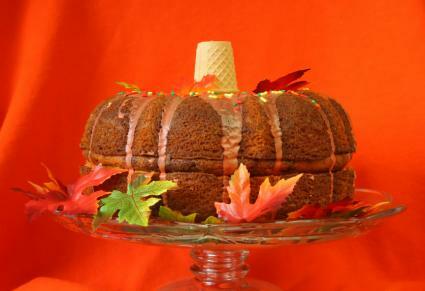 Bundt cakes kind of resemble pumpkins, so stack two together and create one gorgeous cake that will delight everyone at your Thanksgiving table. This cake is also reasonably easy to assemble, so most beginning decorators should be able to make one. If you only have one Bundt pan, prepare and bake one cake mix according to the package directions and then wait to prepare the second mix after you have removed the first cake from the pan and have washed and resprayed it with non-stick cooking spray. If you have two pans, prepare both mixes and bake both pans at the same time. While the cakes are cooling, mix the pourable icing and tint it orange with gel food coloring. When both cakes have cooled, select one to be the bottom layer. Place it on a plate and then slice a 1-inch thick layer off the rounded top of the cake to level it. Place another plate on top of the area you just sliced and carefully flip the cake so the area you sliced is now the bottom of the cake. Pour some of the orange icing around the middle of what is now the flat top of the bottom layer. This will add some flavor to the center and help the top layer stick to the bottom layer. Just try not to pour too much icing because you don't want it to drizzle down the sides just yet. Carefully place the other cake on top of the bottom cake layer so they align perfectly. Gently press the ice cream cone into the center hollow at the top of the cake just far enough that it sits securely. Pour more icing around the top of the cake and let it drip down the sides. Add the sprinkles immediately so they stick to the icing before it dries. Place the cake on the stand, arrange the leaf garland around it, and it's ready to grace your buffet. Consider one of many other Thanksgiving designs if the ones above don't fit your celebration. Turkeys are undoubtedly the stars of Thanksgiving feasts. A turkey cake can take many forms, from a realistically shaped roast bird cake like the one above to a simple piped turkey design or even one made with a 3D cake pan. Piped turkey - You can create a turkey design on any cake by using a small open decorating tip to pipe a black outline of your design on the flat surface. You can then tint icing in the colors you need and fill in the design using a small star decorating tip. Just be sure to work out your design on paper first so you have a plan to follow before you begin piping. Shaped sheet cake - Use a shaped pan to create a turkey cake. Shaped pans are available from top cake decorating companies, like the turkey Pantastic pan from CK Products. Shaped pans usually offer cake decorating instructions, including frosting recipes and a guide for frosting the cake. 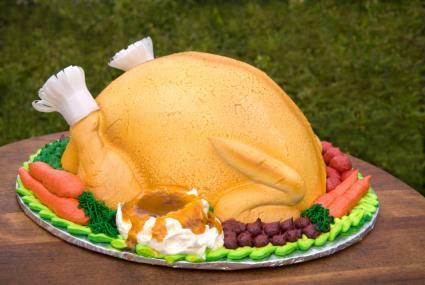 3D turkey cake - A 3D turkey cake is truly a sight to behold after a Thanksgiving dinner. Using a pan like the Nordic Ware Platinum Collection 3D Turkey Cake Pan can help you easily create a beautiful turkey cake that can also double as a dinner centerpiece. Even though a turkey cake might be one of the most common cake designs for Thanksgiving, plenty of other ideas work well for this fall holiday. Harvest cake: Pipe a design featuring a corn shuck, pumpkins and hay bales on top of a large rectangular sheet cake. On a tiered cake, consider making a wheat garland to cascade down one side. Cornucopia cake: Cut a cornucopia design out of a tall layered cake and make fondant fruits and vegetables to spill out of the front, so it looks similar to the one at Coolest-Birthday-Cakes.com. Use this as an opportunity to brush up on your basket weave piping skills at the same time. Fall leaves: Create a simple design for any Thanksgiving cake using fall leaves. 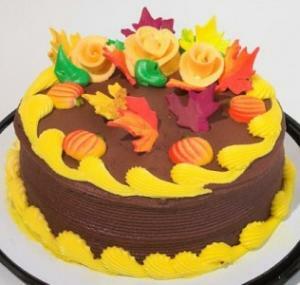 Airbrush, pipe or make fondant maple and oak leaves in autumn colors and scatter them on a cake. Add short message, such as "Happy Thanksgiving" or "Be Thankful" to the center of the cake. Alternatively, use roses and pumpkins to finish out the decorations. Thanksgiving offers an opportunity to go all out with your feast, and that includes dessert as well. Choose a cake design that suits your skills and allow plenty of time to create it. Everyone at your table will appreciate how much effort you put into creating a feast for their eyes as well as their stomachs.